Years ago I had an Italian neighbor who became a close friend. I always commented on her delicious meatballs and one day she shared the recipe with me. I have made them ever since about the same way. You can vary the meats using what's on hand, but I usually select lean ground beef, turkey, chicken or lamb, with an equal amount of sausage; or 1 part beef with 1 part turkey sausage. The base recipe can be used with your favorite pasta sauce. Recently I served these meatballs with spinach ravioli and alfredo sauce and they were scrumptious! In large mixing bowl, measure the meats, bread crumbs, cheese, eggs, onion, garlic, parsley, Italian seasoning, salt and pepper. Mix thoroughly until well combined. Form into 2-inch size balls. Serve with spaghetti sauce or alfredo sauce. This one I'll definitely prepare! Thanks! Fabulous, Claudia! 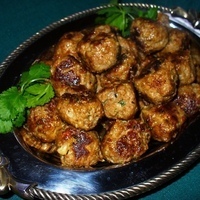 I have been searching for an authentic Italian meatball recipe for ages - not just ground beef. I'm so in love with this. Think I'll do it tomorrow with lean ground beef and hot Italian turkey sausage - or a bit of lamb ... This looks soooo good! My mom's recipe is almost the same as yours! I made these meatballs last night, and they are the best ones I have every made/tasted. My son and husband couldn't stop raving about them either. This recipe is one I will continue to turn to whenever I make meatballs. This weekend I am going to double the recipe and freeze them. Born and raised Italian with parents and grandparents from Italy. I can assure you that these are authentic Italian meatballs. We do not put onion in our meatballs, and we add 1 tsp fresh home dried basil with a dash or two of Italian seasoning. Either way, these are delicious! I appreciate your review, especially because of your Italian heritage! I'll give your herbs a try next time I make these. I will definately try this recipe! These sound really good! I've saved it to try. I used to make a really good meatball.. I never wrote the recipe down because I made them so much and I just threw this and that in never measuring. This sounds a lot like mine except most of the time I throw in some crushed hot peppers. Thank you for sharing. I still seek for the best tasting meatballs that will kick my taste buds. I have my own meatball recipe that is loved by my family, but still wanting another variety. Thanks for your feedback Elaine. Can you suggest the "few other ingredients" missing? This is almost my grandmother's recipe, but leave out the onion, and a few other ingredients are missing. But I am certain these are also very good and delicious. Other meats besides beef and pork will change the flavor some or considerably. Add a little kick with a dash of cayenne or ground red pepper, and saluto! Bobby ~ Great! That's confirmation my Italian Meatballs recipe is fairly authentic. Thanks for your feedback. I am always looking for a great Meatball recipe. I bookmarked it for later. Thanks for sharing with us. Thanks for the comment Arturo. I read your profile and enjoyed it - and I identify with your mom in cooking preferences, though I enjoy "less healthy" cuisines at times like most others too! Several of your recipes look very appetizing and I'll make a point to try some. Will follow you and see what new things you post!